The Damascus and Baghdad governments were dealt a spectacular body blow each yesterday. In one blow to Syrian President Bashar al-Assad’s government, Syrian militants scored one of the biggest gains of their two-year revolt by capturing the strategic northern city of Raqqa. Situated on the highway to the major northeastern towns of Qamishli, al-Hasakah and Deir Ezzor, Raqqa is the first Syrian provincial capital to fall into opposition hands. In another blow to Assad and his ally, Iraqi Prime Minister Nouri al-Maliki, 48 Syrian and nine Iraqi soldiers were killed in an ambush near Akashat, inside Iraq, not far from the Syrian border. 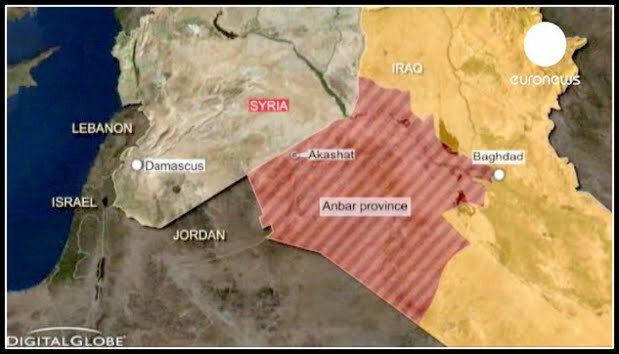 Iraqi officials said the Syrians had sought refuge through the Rabi’a border crossing in northern Iraq during recent clashes with rebels and were being escorted back home through a different crossing farther south when the ambush occurred. The fact the Syrian soldiers were on Iraqi soil at all raised questions about Baghdad’s perceptible willingness to help Assad’s embattled regime by stealth. Maliki told The Associated Press last week a victory for Syrian rebels would spark sectarian wars in Iraq and Lebanon (see my Feb. 28 post, “Iran proxies growl: Hands off Assad”). “If truth be told,” political analyst Elias Harfouche writes today for the pan-Arab daily al-Hayat, “what risks destabilizing Iraq is its prime minister’s prejudiced meddling in the Syria crisis,” his corruption and his blackballing of Iraq’s Sunnites and Kurds. In the same vein, he says, you can rid a country of a tyrant, but you can’t turn it into a democracy if its regime balks at the concept. To prove his point, Harfouche cites the case of Iraq, where he says Maliki’s “democracy” is worse than Saddam’s dictatorship. He also quotes from the first two of a six-part series on “today’s Iraq” penned by Patrick Cockburn for The Independent. Iraq is disintegrating as a country under the pressure of a mounting political, social and economic crisis, Iraqi leaders say. As the pre-eminent leader of the Shiites, three-fifths of the population, he alarms them by suggesting that their political dominance is under threat from the Sunni, a fifth of Iraqis, once in charge under Saddam but now marginalized. Last year, Maliki sought to unite Sunnite and Shiite Arabs against the Kurds, another fifth of the population, by massing troops and threatening to invade Kurdish-controlled but disputed areas. Last week, Harfouche recalls, Maliki warned that a victory for the opposition in Syria would lead to “a civil war in Lebanon, divisions in Jordan and a sectarian conflict in Iraq.” His warning echoed Assad’s earlier threat – namely, that sparks from his regime’s fall would ignite the entire region. Harfouche says the alarming trade-off being proposed is this: we [Assad and Maliki] shall keep the peace in Syria, Iraq and the entire region if you let us keep our sectarian hold on power in Damascus and Baghdad. “If truth be told,” Harfouche writes, “what risks destabilizing Iraq is its prime minister’s prejudiced meddling in the Syria crisis and his piloting the de-structuring of Iraq through corruption and the exclusion of large numbers of Iraqi Sunnites and Kurds from public office and the decision-making process.